Part of our work involves cleaning after building companies and transforming the site they worked on. Our aim is always to ensure that they hand over their project in pristine condition. Sometimes we are approached by building companies and other times by flooring companies in need of assistance when dealing with the job. 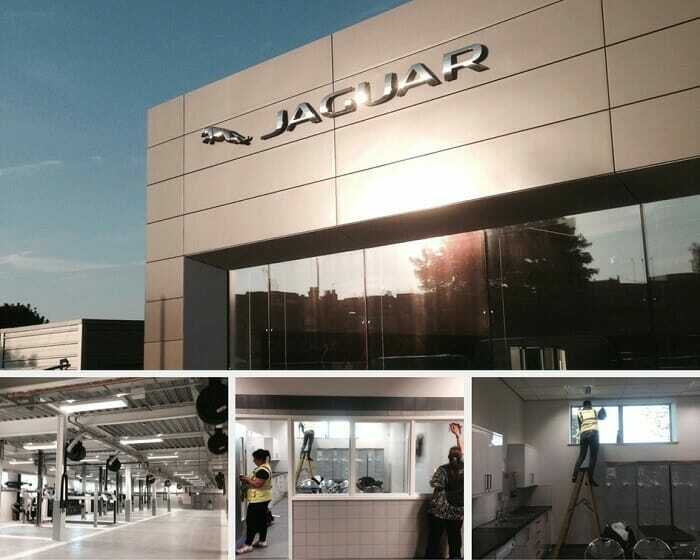 The site we were hired to help with was the Jaguar & Land Rover car dealership in Barnet. The refurbishment project was a rather big one, aimed at the complete makeover of the place. The place had gone through a major transformation: from a single one story building to a massive 3 story and a basement level for servicing vehicles. The basement alone is a 500 square metres area, the ground level showroom not far behind, with the capacity to house more than 30 vehicles. There is also a café and a reception area with offices located on the first floor. All in all, it was a pretty drastic refurbishment project with a major extension involved, which needed one final touch: a sparkle clean before the final inspection of the client. This was definitely a job for us, as our cleaning service is known for being able to cover a lot of ground in minimal time. We carried out this service overnight with 4 cleaners and a supervisor on site to oversee and inspect the work. Cleaning the area would have been difficult for other companies, but not for ours. Since we specialise in this kind of service, it is safe to say that it wasn’t much of a challenge. As a result, we were then approached by the building company to continue with the cleaning service. One more session of sparkle clean was booked, this time with more cleaners involved. Six cleaners were allocated for the job for twelve hours. It is understandable why they needed this cleaning service carried out professionally, as they were handing over the complete refurbishment and extension project to their client the very next day. Again, our company was ready to meet the short deadline. Thanks to our efficient organisation and methods, we sparkle cleaned the area professionally and to a very high standard without any delays. Once again our cleaners stood out as proven experts in the field and more than capable of dealing with projects like these. To be able to clean so quickly and to such a high standard without stressing over the coming deadline is no small feat. The client was more than satisfied with the service we provided and even booked one more cleaner the next day, during the handover of the building project. We have since provided a number of services at the site, and we are now looking at taking on another dealership while working closely with the same company.We are confident that once again we will provide top level cleaning service, without a problem. When’s the best time of day to do the housework?